While it can be challenging to menu plan on a budget, it can be done. If you have a tight grocery budget, you can’t afford not to menu plan. When you don’t know what’s for dinner, you will find yourself eating out or making multiple trips to the store and spending extra money. 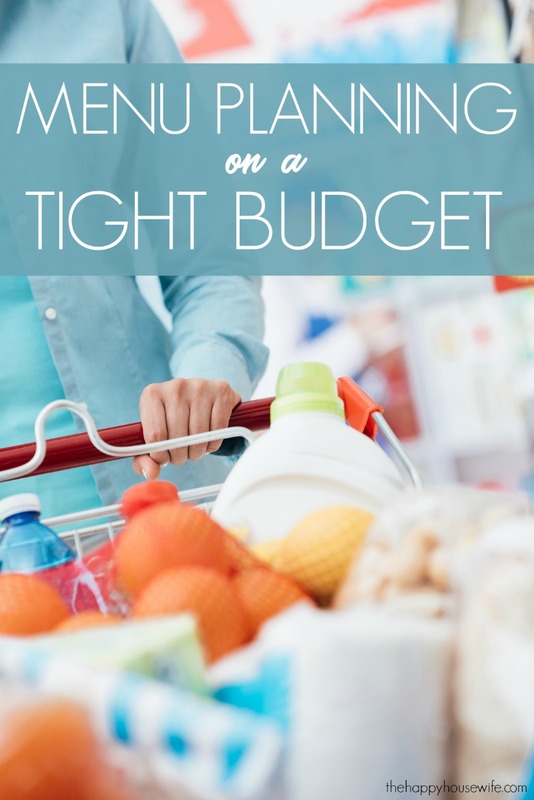 If you’ve stumbled across this post it’s probably because you have a limited grocery budget, and need to learn how to cut back where you can. I’ve shared my meal planning story many times, but years ago I found myself needing to cut back on spending and after taking a look at our family’s grocery budget I realized I could cut WAY back! I was shopping multiple times a week and never really had a plan. After I start to menu plan and shop the sales (and use a few coupons) I was able to cut our grocery budget in half! Print or look up your grocery store’s weekly ad. Usually these store circulars are found near the entrance or near check out. Even stores like Aldi and Walmart have them. Before you start menu planning for the week, pick up a copy of the ad for reference. Shopping sales is one of the best ways to save money on your menu plan, so you’ll want to have this handy. For example, if your local grocery store has chicken breasts on sale that week, then add several chicken dishes to your menu plan. Since meat can be one of the biggest grocery budget busters, finding ways to save is a key component to menu plan on a budget. Also, if you have a little extra money in the grocery budget, stock up on sale items that you know will last and you can use in a future menu plan. to round up all your coupons so you can see if there are any great deal match-ups. There are many blogs out there who do this for you, so save time and find a website that posts coupon match-ups every week. Don’t forget that many stores now offer their own store coupons and coupons in their apps. These don’t even have to be cut, you just need to virtually clip them in the app and they are automatically deducted from your total. Check to see what you already have in your freezer and pantry. pantry and write down everything you have. Using food you’ve already purchased will save you money (you aren’t throwing away rotten food) and time because you’ll have to buy less at the store. Grab your free freezer and pantry inventory printables here. Maybe you have a bag of rice in the pantry and some frozen beef in the freezer. Purchase some fresh or frozen vegetables and you have a full meal using up what you’ve already purchased. Look at your store circular to see if you can combine what you have with something on sale to make a meal. Once you know what you have, what’s on sale, and what coupons are available it’s time to meal plan. Start by looking at what match-ups. Are you able to make a meal from one of the match-ups of either what you have and what’s on sale, or what’s on sale and a coupon? Need menu planning worksheets? Download our free resources here. You can even do all three! Once you’ve exhausted the possibilities, search online. Can you find any recipes to make using the ingredients available to you through sales or what you have? There are even websites that allow you to list ingredients and they search the web for recipes based on what you already have or what is on sale. Often I had trouble coming up with meals my kids would actually eat. 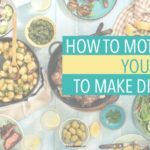 I ended up creating a list of “go-to” meals that I would pull from when I created my menu plan. I explain more about how I created a list of meals my family would eat here. One of the best ways to keep your grocery budget low is to plan simple meals. Meatless meals are very inexpensive or consider mixing your meat with beans or rice to make it stretch. Create meals that will yield leftovers that can be used for lunch for additional savings. Can you use some of the leftover ingredients for breakfast? For example one might we might have tacos and the next morning we can use some of those ingredients for egg burritos. Stay away from fancy meals with ingredients you will never use again. It’s easy to bust your budget by spending $5 on an spice or sauce that you will only use once. If you have children they probably prefer the simple meals anyway. When I learned to menu plan on a budget it dramatically changed our family’s finances. We were able to get out of debt and save hundreds of dollars every month (without using coupons!) just by creating a menu plan every week. Not only did we save money, we ate healthier because we avoided those late minute trips through the drive-thru because I didn’t have a plan. If you need to trim your family’s budget, start with menu planning. I promise you will save money and you will never wonder what’s for dinner again. Looking to save more money? Check out some of the best money saving financial blogs for moms on GoBankingRates.com.